They have been best buddies since their first breaths in January 2008. 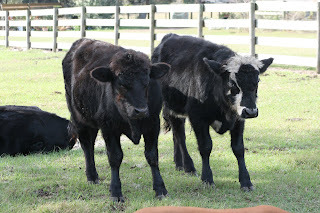 Now the one on the left will be leaving home and continuing on his path of growing into a big bull with his own harem of cows to blend his genes with. He will be living in Plant City, Florida. He will have a good life, saved from processing and packaging and becoming table food. Melanie, Wayne and Marie will take good care of him. He's a good boy, going to a good home---yes!